The only place to find all the results from Central PA sprint car racing as well as original articles about the sport. Covering everything sprint car related in Central PA. Including 410's,358's,360's,305's and Super Sportsman . SUN PRAIRIE, Wis. (July 26, 2018) - The “Kunkletown Kid” Ryan Smith earned his first Arctic Cat All Star Circuit of Champions presented by Mobil 1 victory of the 2018 season in a thriller on Thursday night at Angell Park Speedway, inheriting command with just two circuits remaining after race leader, Carson Macedo, retired with mechanical woes. In actuality, Smith, the part-time pilot of the McGhee Motorsports/Mike McGhee and Associates/No. 11 sprint car, inherited the lead twice during the All Star/IRA Outlaw Sprint Series event in Sun Prairie, Wis., but the second proved to be worth $5,000. 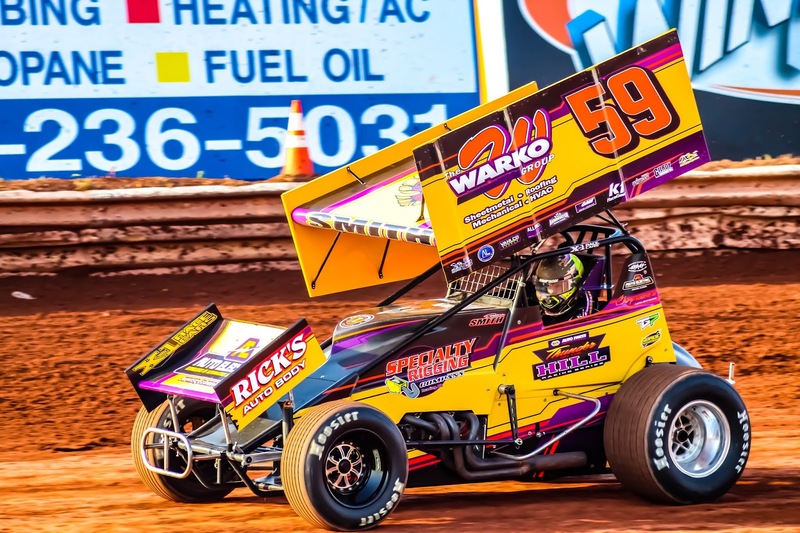 Multi-time IRA Outlaw Sprint Series champion, Bill Balog, rallied nine positions to finish second at Angell Park Speedway, followed by Dave Blaney, Chad Kemenah, and California invader, Rico Abreu. Although Smith started from the pole position, it was fellow front row starter Aaron Reutzel who earned the early advantage, immediately taking control of the 24-car field as the opening green flags waved. A quick pace around Angell Park Speedway’s 1/3-mile, clay oval led the Cute, Texas, native into traffic for the first time on lap four. Despite multiple roadblocks in the form of lapped cars, Reutzel was able to maintain momentum by utilizing the speedway’s gnarly cushion, weaving through traffic safely until the main event’s first caution appeared on lap 13. Unfortunately for Reutzel, he would become involved in that caution, eventually forced to retire and surrender the lead after another driver made contact with the seven-time All Star winner while attempting to slow for the caution. Reutzel’s damage was severe and would not return. With Reutzel out, Ryan Smith would inherit the top spot, now with Chad Kemenah and Carson Macedo on his heels. Smith led the field for the next five circuits until a mistake cost him the point position. Miscalculating the turn four cushion, Smith jumped the edge of the racing groove and nearly lost control allowing fifth-starting Carson Macedo to drive by to lead lap 19. Ironically enough, the turn four cushion, which nearly ended Smith’s feature campaign entirely, gave the “Kunkletown Kid” a second chance. As Macedo was battling through traffic with two and a half laps remaining, the Lemoore, Calif., native hopped the curb in turn four resulting in terminal front end damage. Macedo limped across the line but caution flags waved soon thereafter setting up a green-white-checkered restart. Ryan Smith inherited the top spot, ultimately holding off Bill Balog and Dave Blaney at the final checkers. The Arctic Cat All Star Circuit of Champions presented by Mobil 1 will continue their four-day trek through the Midwest with a stop at the Jackson Motorplex in Jackson, Minn., on Friday, July 27. Tony Stewart’s All Stars will battle for a $10,000 top prize during their visit to southern Minnesota’s state-of-the-art complex; the first and only All Star visit to the Land of 10,000 Lakes in 2018. Jackson Motorplex in Jackson, Minn., will open pit gates at 2 p.m. on Friday, July 27. A mandatory All Star Circuit of Champions drivers meeting will take shape at 6:30 p.m., followed by hot laps at 7:30 p.m. Those seeking additional news and notes should visit Jackson Motorplex live on the Web at www.jacksonmotorplex.com.